Job Summary: This is an entry level position at the clerical level. The selected candidate will undergo one year training and development and upon successful completion of training period, they will be eligible for confirmation in Assistant (A1) level. Selected candidates will be placed anywhere in Nepal including below mentioned rural branches as per the Bank’s requirement. 100 Position including two position each for local candidates from rural municipalities (Gaupalika) mentioned below. In case of non availability of successful Local candidates same shall be fulfilled from Non local successful candidates. • Bachelor’s Degree or equivalent with minimum Second Division or 2.5 CGPA out of 4 CGPA from a recognized university/ College/ Institution. Equivalence certificate from recognized authorities of Nepal Government is must in case of degree from Foreign universities/College/Education Institution. **The local candidates from below mentioned Rural Municipalities (Gaupalika) willing to work in the respective rural municipality and having completion of 10+2 or equivalent degree with minimum second division can also apply for the position of Trainee Assistant. 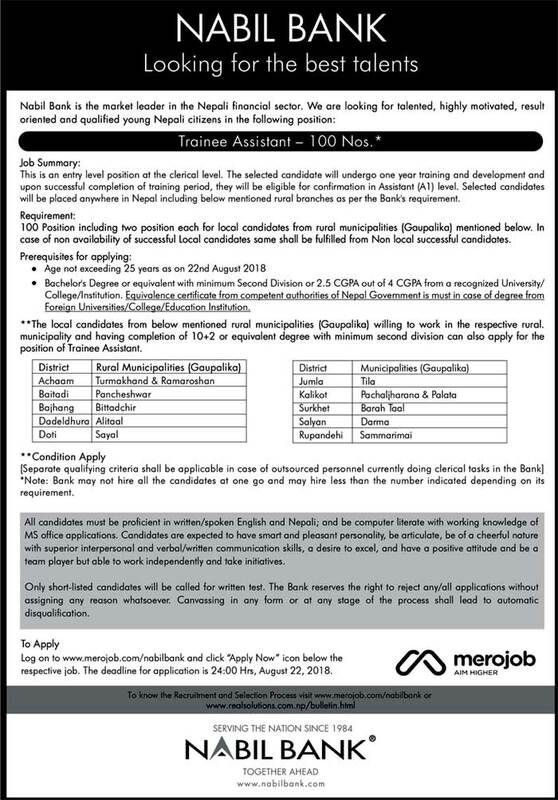 All candidates must be proficient in written/spoken English and Nepali; and be computer literate with working knowledge of office applications. Candidates are expected to have smart and pleasant personality, be articulate, be of a cheerful nature with superior interpersonal and verbal/written communication skills, a desire to excel, and have a positive attitude and be a team player but able to work independently and take initiatives.